Nick Knack: Chick Webster poses with New York Ranger teammates just before Christmas in 1949. That’s him standing second from left. 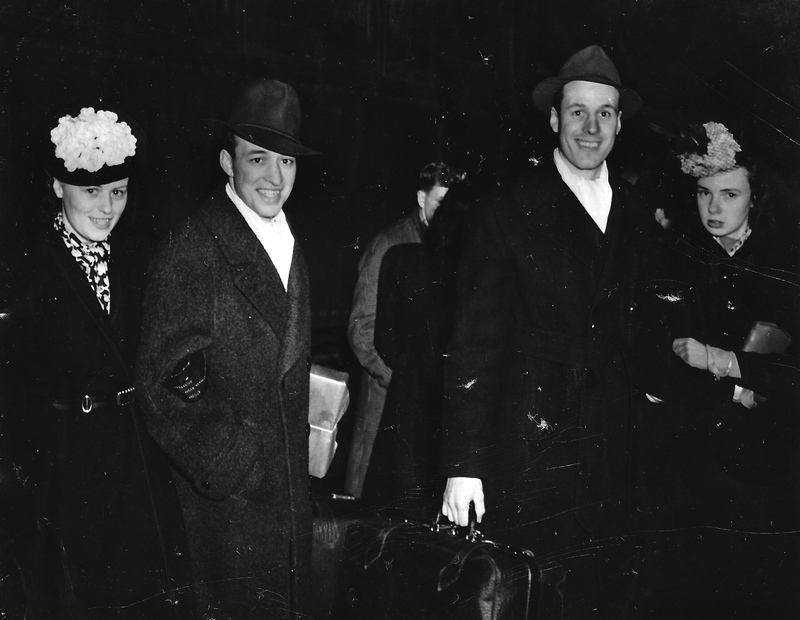 Others pictured include Tony Leswick (to Webster’s right) and Pat Egan, to his left; Wally Stanowski (standing fifth from left); and captain Buddy O’Connor. 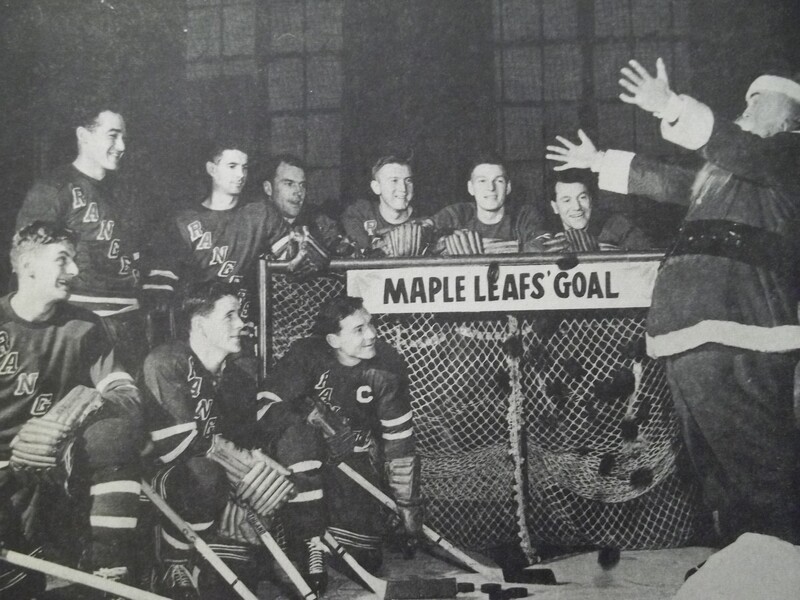 Suited up as Santa is erstwhile Ranger Phil Watson, whose non-festive job had him coaching the EHL’s New York Rovers. The Boston Bruins honoured their late captain, coach, and GM Milt Schmidt this week with a video tribute ahead of Thursday’s meeting with the Edmonton Oilers. On their sweaters, Bruin players wore a patch blazed with Schmidt’s 15 to commemorate the man they call the Ultimate Bruin. With Schmidt’s death on Wednesday at the age of 98, the oldest living NHLer is Chick Webster, who’s 96. He lives in Mattawa, Ontario. If his hockey CV is 848 NHL games shorter than Schmidt’s and also lacks its Stanley Cups, it’s long and varied and entirely commendable in its own right. Born John Webster in Toronto in 1920, his NHL career spanned all of 14 games, all of which he played with the New York Rangers during the 1949-50 season. On Friday, I exchanged e-mails with Rob Webster, Chick Webster’s son. He’d just spent the afternoon visiting his dad who, he said, had been saddened to hear about Schmidt. Never one to seek attention, he’s been taking this week’s sudden burst of interest in his brief stint in the NHL in stride. As a teenager, Webster senior played for teams in Toronto called the Stockyard Packers and (as an OHA junior, with Baldy Cotton as his coach) the Native Sons. He wasn’t big, 5’11”, 160 pounds, but he was a good skater and a proficient playmaker. Like Schmidt and many other hockey players during, Chick Webster decided he had another job he’d better do. Enlisting in the Canadian Army, he ended up skating for the Army’s Petawawa Grenades before shipping out for deployment overseas. Serving with the 13th Field Regiment, Royal Canadian Artlliery, he saw duty in England, France, Holland, Belgium, and Germany before the war’s end. Back in hockey, he returned to the EAHL before graduating to the AHL’s New Haven Ramblers. 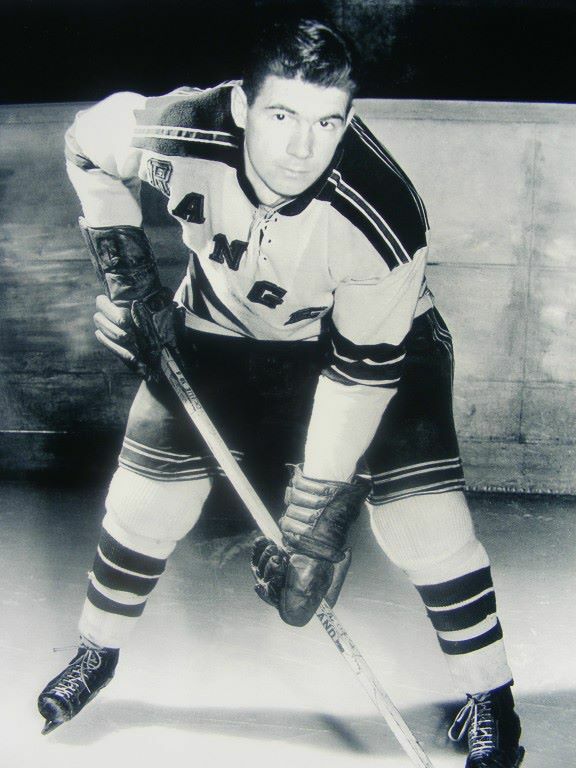 It was from there that he launched into the NHL, called up by the New York Rangers in December of 1949. Coached by Lynn Patrick, the Rangers were up with Detroit and Montreal at the top of the league standings. 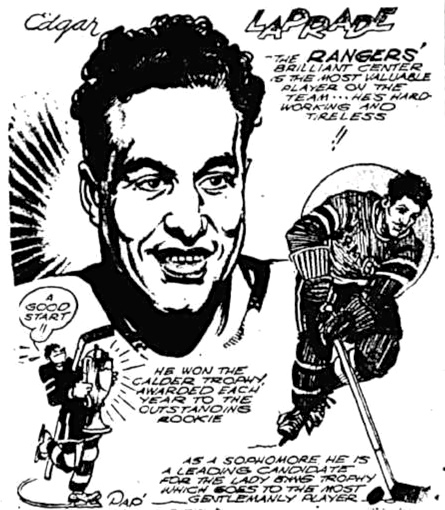 Edgar Laprade and Buddy O’Conner featured bright among the team’s forwards that year, and Fred Shero was on the defence. 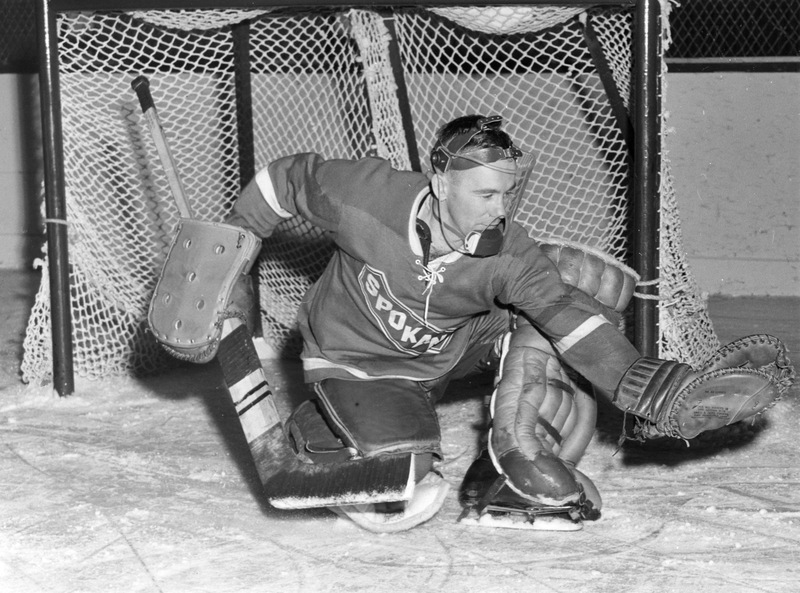 In goal, Chuck Rayner was backed up by Emile Francis. Christmas Day, in Toronto, he left a game against the Leafs charley horse’d. In mid-January, in a game with Detroit at Madison Square Garden, he broke a couple of bones in his left hand — unless someone else broke them for him. (Another Ranger winger, Ed Slowinski, also finished the game with a fractured hand). Either way, it was Webster’s 14th and final appearance on NHL ice. Playing left wing, he’d recorded no goals or assists while sitting out two minor penalties. When he’d healed a bit, he returned to the New Haven ice wearing a soft cast, finishing the season in the AHL while the Rangers went on to defeat in the Stanley Cup finals at the hands of the Red Wings. Don Webster, Chick’s younger brother by four years, had his own NHL stint: he played 32 games for the Toronto Maple Leafs across the 1943-44 regular season and playoffs, scoring seven goals and 13 points. Don Webster died in 1978 at the age of 53. I asked Rob Webster to ask his dad who were the players he’d admired in his playing days and the answer that came back included Gordie Howe, Rocket Richard, and teammates Laprade, O’Connor, and Rayner. The latter years of his hockey career took him around the minor-league map — Tacoma, Cincinnati, Vancouver, and Syracuse (where he played, unhappily, under Eddie Shore) — before he made his return to the Toronto area. 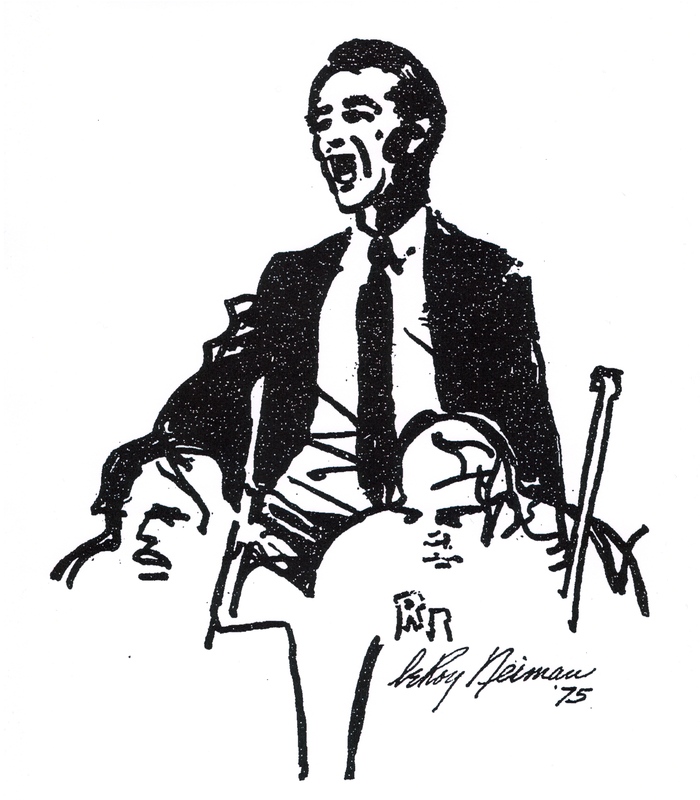 He continued to play after he went to work for de Havilland Aircraft of Canada, before retiring, in 1969, to Mattawa. In The Army Now: Chick Webster (that’s him in the front row, third from right) poses with the Petawawa Grenades, circa 1943-44. 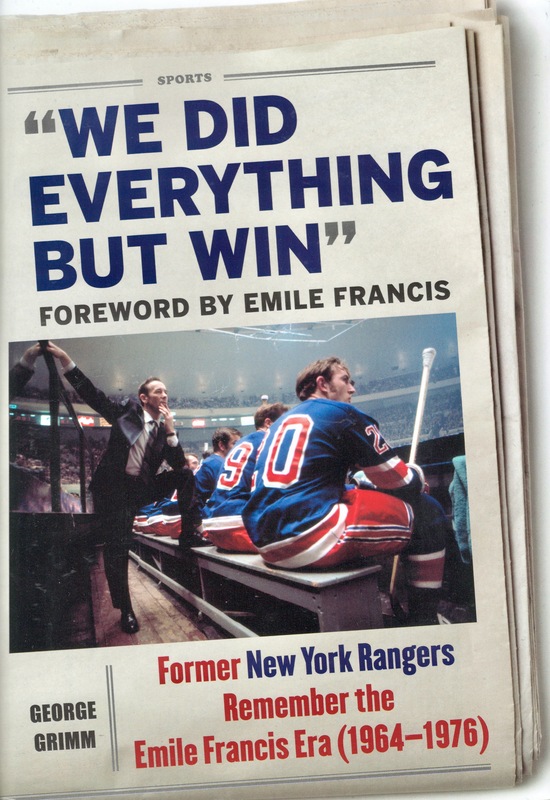 The New York Rangers won the Stanley Cup in 1940, it’s true, but mostly their standing during the years of the Second World War was lowly: from 1943 through the spring of 1945, the team finished last in the NHL every time. 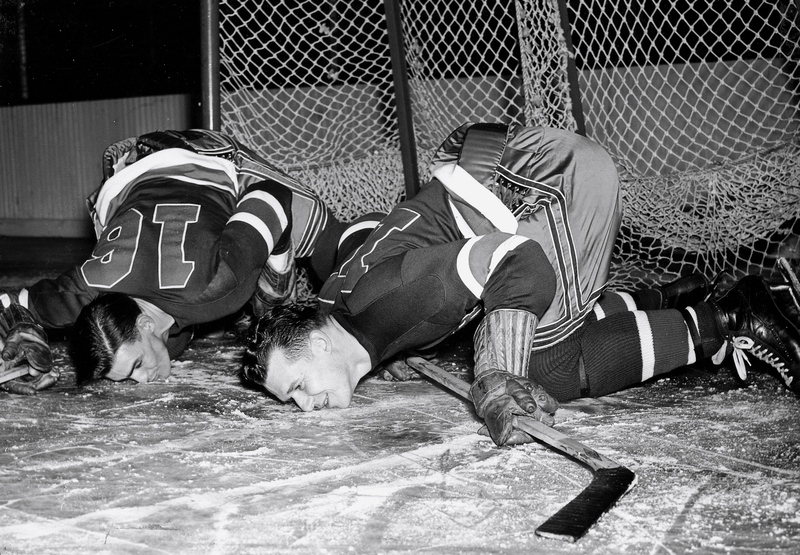 The worst ever to have worn Ranger sweaters, GM Lester Patrick called those teams. Heading into the post-war, he had reason, at least, for hope. Returning from military service were many of the stalwarts of that Cup-winning team from back in ’40, including Alex Shibicky, Mac and Neil Colville and Patrick’s own sons, Muzz and Lynn. Lesser lights back from the wars included the wingers shown above expressing their pleasure at being back on NHL ice at Madison Square Garden: left is Hal Brown, 25, from Brandon, Manitoba and, on the right, and Toronto-born Alan Kuntz, 26. In goal, the Rangers had Jim Henry and Chuck Rayner coming in to replace the ’44-45 partnership of Ken McAuley and Doug Stevenson. And rookies looking to make the team for the first time included Edgar Laprade and Cal Gardner. It took another whole year, as it turned out, for the Rangers to ascend from the basement, moving into fifth ahead of Chicago in 1946-47. Another year after that, they even made the playoffs. By 1950, they were improved enough to play for the Stanley Cup — though they did, of course, lose in the finals to Detroit. If it were anyone else, we might be able to swing players around to fill the gap. But the loss of Laprade is serious trouble. 1. Mine Centre, Ontario, was where he was born, in October of 1919, at the Lakehead, 190 miles west of Port Arthur on the Canadian Northern Railway. “There’s some good fishing there,” Laprade told Kevin Shea at the Hockey Hall of Fame in 2006. 3. Playing in Port Arthur, Laprade was a Bruin before he graduated to the mighty Bearcats, for whom he starred with his brother Bert, a defenceman. They won the Allan Cup in 1939, beating the Montreal Royals, and would have gone on to represent Canada at the 1940 Winter Olympics if war hadn’t swept it off the calendar. In February of 1941, local fans organized Laprade Night ahead of a game with the Fort William Hurricanes where they presented the boys with silver tea services. Actually, no, just the one: it was wartime, after all, and they would have to be content to share. 5. After Elmer Lach broke his arm in the fall of 1941, Canadiens’ manager Tommy Gorman tried to lure Laprade to Montreal, and it looked like he might be lured, too, until Patrick said nyah-uh, refused to cede his rights. 6. As Don MacEachern has written in his review of western Canadian service hockey, the Port Arthur hockey team bifurcated in 1942, creating a new team, Shipbuilders, to compete against the Bearcats. Edgar and Bert stuck with the latter while a third Laprade brother, Remi, suited up for the new team. A hybrid version of the two ended up in the Allan Cup Final in the spring of 1942 where they lost to a powerhouse RCAF Flyer team boosted by the talents of recent Boston Bruins Woody Dumart, Milt Schmidt, and Bobby Bauer. By the fall of 1943 Bert was on the ice for the RCAF. Edgar went to Ottawa to enlist in the Army’s Ordnance Corps. For the rest of the war he served, on the ice and off, in Winnipeg and Kingston. 7. That’s where Frank Boucher, who was coaching the Rangers, went to work, in the summer of 1945. Through a friend he found out that Laprade was worried about a $5000 payment on a house in Fort William. He got an old Kingston pal, former Ranger great Bill Cook, to arrange a dinner. Boucher’s offer was a two-year contract worth $15,000 along with a $5000 signing bonus. Laprade agreed. According to Boucher, he then had to convince Lester Patrick to go along with the deal. Which he did, eventually, grudgingly. 8. The Rangers weren’t sorry. At 26, Laprade won the Calder decisively, well ahead of Chicago’s George Gee and Montreal’s Jim Peters. 9. He impressed Lloyd Percival as the shiftiest puck-carrier in the NHL. 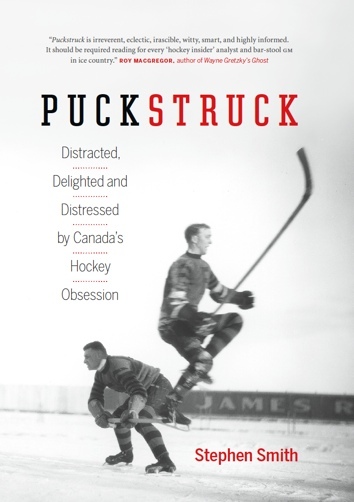 And when the author of The Hockey Handbook (1951) asked veteran hockey writers who were the best skaters they’d seen, the list included Syl Apps, Eddie Shore, Howie Morenz, Max Bentley, Maurice Richard, Frank Mahovlich, Bill Mosienko, Gordie Howe, and Laprade. He was very difficult to check as the lie of his stick meant he could keep the puck very close to his feet. I believe ‘Teeder’ Kennedy of the Leafs was the only other player of that era to also use the same lie stick. Few men in hockey have been better than Edgar. Between the blue lines, few have been his equal at puck control. Edgar and some other lad can dash in that center ice and both get spun around. But usually it is Laprade who comes up with the puck. Yet, the same fellow within 15 feet hasn’t anywhere near the same control. His shots, when he gets them, are fluffy. The fastest man on balance at center ice seems to be the last one to get it down near the goal. How Laprade gets into that position where he has no shot but a futile backhander is a real puzzle. Maybe if they could change that line around the goal from red to blue, nothing will stop him. 14. He never was a prolific scorer, it’s true. His best year, 1949-50, when he won the Lady Byng, he had 22 goals. In the 500 NHL games he played in his career, he notched 280 points, with another 13 in the playoffs. 15. Gentlemanly is an adjective he wears, and earned, no doubt. He went whole seasons, as the obituaries remind us, without incurring a single minute of penalty punishment. And yet he did what he had to do: in that tea-service game in 1941, the Laprades were front and centre in the game’s only fight, a double date in which they teamed up to trade punches with Fort William’s Stan Robertson and Joe Konderka. Teddy Lindsay just nailed him this one time. You know, I still remember when he hit him. Oh, jeez, the blood all over the place. That’s the only guy Ted Lindsay ever went back to and said he was sorry. He kind of looked at Edgar and he almost apologized. But I don’t think he did. Pretty close, yes.